I’ve been feeling bad that my last post was a tad, well, unreadable. So this is the condensed version. With charts (see, I do love you, Gem). So, the question is: Has the introduction of Acas early conciliation been (a) successful; and/or (b) a good thing for workers’ access to justice, to set against the justice-denying impact of the hefty employment tribunal fees introduced in July 2013? Which begs a further question: What does ‘successful’ mean? Early conciliation will have been a success if it can be shown that, at least in part, it has caused a reduction in employment tribunal claims and/or earlier resolution of workplace disputes and/or resolution of workplace disputes that lead to better satisfaction with dispute resolution services. Has early conciliation caused a reduction in employment tribunal cases since its introduction in April 2014? 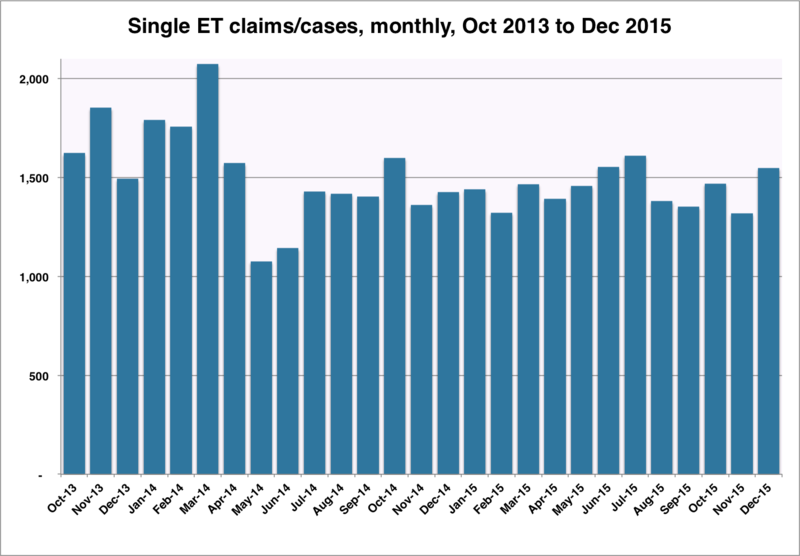 As the following chart shows, there has indeed been a (relatively small) decline in the monthly number of single ET claims/cases since April 2014. If we ignore March 2014, when there seems to have been a rush of such cases to beat the introduction of early conciliation (just as there was in July 2013, to beat ET fees), the monthly average number of single claims/cases has fallen by 15 per cent, from 1,703 over the five-month period October 2013 to February 2014, to 1,447 over the most recent six months for which figures are available, July to December 2015. According to that 2014 Impact Assessment, Acas early conciliation was supposed to bring about a 17% fall in ET case numbers. So, job done, everyone can go home. Of course, just as junior injustice minister Shailesh Vara argues that the steep fall in ET case numbers from July 2013 was caused by factors other than the introduction of hefty ET fees in July 2013, it could be argued that the relatively small decline from April 2014 was caused by … oh, I don’t know, maybe global warming or something. Whatever, since April 2014, Acas early conciliation has acquired a further objective, one not mentioned in that Impact Assessment: providing the Ministry of Injustice with a fig leaf for that sharp fall in ET case numbers from July 2013. There has been no denial of access to justice, says Mr Vara (in his oral evidence to the Justice committee of MPs, on 9 February this year), because everyone can go to Acas and have their potential ET claim conciliated. For free! The problem is, not everyone does get their potential ET claim conciliated by Acas. We can see this in the following chart. For a full explanation of this chart and its assumptions, see my previous (unreadable) post. But, in a nutshell: the green area is the actual number of single ET claims/cases (by quarter); the blue area is the number of successful Acas conciliations of single cases; and the orange area is the number of ‘missing’ single ET claims/cases – that is, the difference between the actual number of such claims/cases plus the number of successful Acas conciliations, and my (conservative) projection of the number of single ET claims/cases we could have expected, had both ET fees and Acas early conciliation not been introduced. (And that projection allows for both the pre-existing, mild downward trend in ET case numbers, and the improving economy, each cited by Mr Vara as key factors in the sudden, sharp fall in ET case numbers from July 2013). 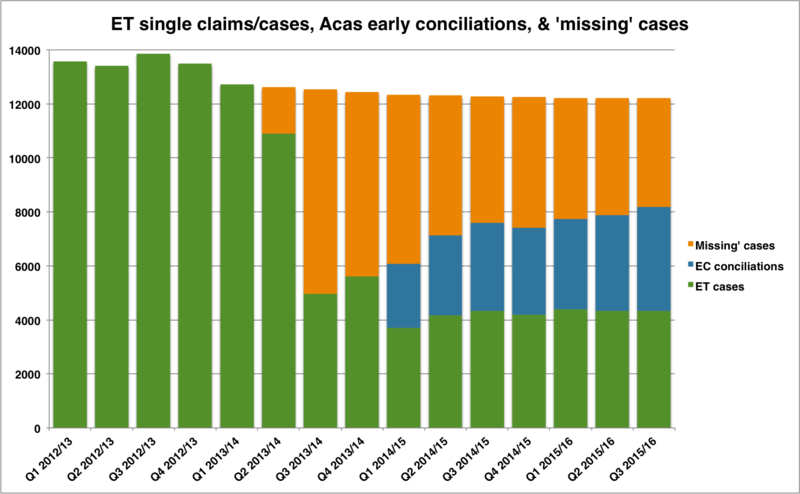 As of 31 December 2015, the total number of ‘missing’ single ET claims/cases – i.e. the number of ‘lost’ cases that cannot be explained away by the introduction of Acas early conciliation, and/or the pre-existing downward trend in ET case numbers, and/or the improving economy – is 49,937. And, if my projection is too conservative, then the number of ‘lost’ cases is even greater than 49,937. In short, Acas early conciliation provides the naked Mr Vara with a less than adequate fig leaf for the justice-denying impact of ET fees. Yes, I know, that’s a truly horrible image. At this point, Mr Vara would probably ask to ‘phone a friend’, and everyone’s favourite mathematical genius, Cabinet Office minister Matthew Hancock MP, would explain to us that all 49,937 ‘lost’ ET claims/cases were vexatious or otherwise unfounded claims that should never have been brought in the first place. He might even aver that all 49,937 workers went to Acas, only to be told that their potential ET claim was in fact a pile of pants. However, if that were true, then removing such vast numbers of weak or hopeless cases from the ET system would have sent the overall success rate of ET claims rocketing up towards 100 per cent. And, sadly for the Hancock Theorem, the very opposite has happened – the overall success rate has fallen since mid-2014, when claims made post-July 2013 began to dominate the outcome statistics. Sadly for him – and for anyone within sight – Mr Vara’s fig leaf is vanishingly small. This entry was posted in Justice, Workers' rights and tagged Acas early conciliation, Employment tribunals, ET fees. Bookmark the permalink.